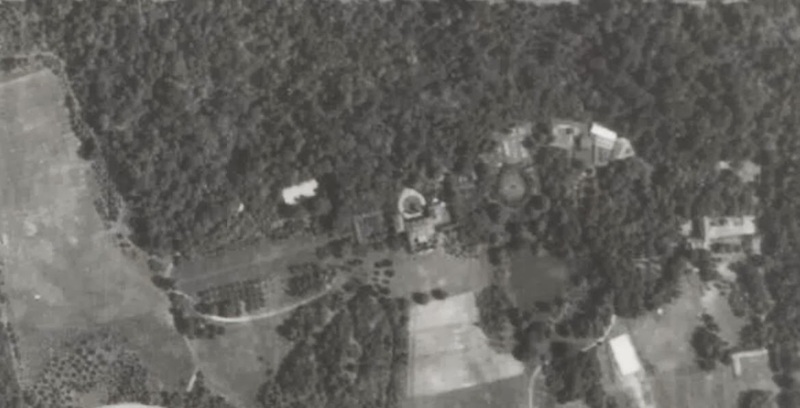 A 1938 aerial of 'Old Acres', the Robert Bacon estate designed by John Russell Pope c. 1907 and 'Arlough', the Robert Low Bacon estate designed by John Russell Pope c. 1916 in Old Westbury. Click HERE for more on 'Old Acres' and HERE for 'Arlough'. Photo from Stony Brook University's Digital Archive. I don't know why, but I always get so sad driving down I.U.Willets. I'm sure in it's heyday, it must have been one of the most beautiful roads to drive on. Wow, 'Arlough' has been enlarged to nearly unrecognizable. In Zach’s posting of ‘Old Acres’ he stated the house sat “somewhere on the Bacon property … “. I want to just point out that with this aerial someone (with more computer skill than I have) can mark the house site on Google Earth. Anonymous number 1, I get same feeling on IU Willets. It was one of the nicest roads. Now properties like Templeton just look uncomfortably doomed as really large, particularly ugly houses keep cropping up and charming ones keep going down. Were there other estates west on IU Willets, heading towards Albertson? I was wondering because of the Clarke Estate, and I thought I read here somewhere of Irish Row, which started on IU Willets.